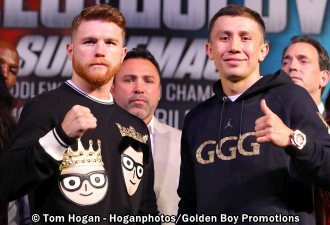 Saul "Canelo" Alvarez vs. Gennady "GGG" Golovkin rematch will take place at T-Mobile Arena in Paradise, Nevada on Saturday, September 15, 2018 (Sunday Philippine time). The super fight was originally scheduled on May 5, 2018. But in March 2018, Alvarez failed a drug test and was found positive for the use of clenbuterol. He was suspended by the Nevada Athletic Commission for six months. Canelo formally withdrew from the Golovkin fight, but changed his mind and renegotiated the rematch and it was rescheduled on September 15 after his suspension expired. Saúl Álvarez Barragán is an American Spanish, born July 18, 1990 (age 28) in Guadalajara, Jalisco, Mexico, known as Saúl "Canelo" Álvarez, is a Mexican professional boxer. He is a multiple-time world champion in two weight classes, having held the WBA (Unified), WBC and The Ring light middleweight titles between 2011 and 2013. He was also the WBO light middleweight champion from 2016 to 2017 and the WBC, The Ring and lineal middleweight champion between 2015 and 2018. As a professional, Canelo had fought in the welterweight, light middleweight and middleweight divisions. He stands 5 ft 9 in (175 cm) with a reach of 70 1⁄2 in (179 cm) and has an orthodox stance. In his 52 total fights, he has 49 wins, 34 by KO, 1 loss and 2 draws. Alvarez is ranked as the world's top boxer, pound for pound, byBoxRec, No. 4 by The Ring and the Boxing Writers Association of America. He is also ranked as the world's top middleweight by BoxRec, and No. 4 by the Transnational Boxing Rankings Board. His nickname "Canelo" in Spanish is the masculine word for cinnamon, which is a nickname for people with red hair. Gennady Gennadyevich Golovkin was born on April 8, 1982 (age 36) in Karaganda, Kazakh SSR, Soviet Union. He is known by his nickname "GGG" or "Triple G", is a Kazakhstani professional boxer who currently is the unified WBA (Super), WBC, and IBO middleweight champion. GGG was the IBF middleweight titlist from 2015 to 2018. He is the world's top middleweight by the Transnational Boxing Rankings Board (TBRB), and No. 2 by The Ring and BoxRec. He is also the top boxer, pound for pound, by The Ring, No. 2 by ESPN, No. 3 by the Boxing Writers Association of America, and No. 4 by BoxRec and the TBRB. Golovkin had fought in the middleweight division only. He stands 1.79 m (5 ft 10 in.) with a reach of 178 cm (70 in). His 39 total fights has 38 wins 34 by KOs, no loss and 1 draw. Golovkin now holds the longest active unified championship rule, with five consecutive title defenses to his name. Golovkin has never been knocked down or knocked out in a total of 389 fights, 39 matches as a professional and 350 bouts as an amateur boxer. Golovkin won a gold medal in the middleweight division at the 2003 World Championships in Bangkok, Thailand. He fought at the 2004 Athens Olympics, winning a middleweight silver medal when he lost to Gaydarbek Gaydarbekov of Russia in the finals.